Hiya! I am on Winnie & Walter Blog today with this card today. Its a clean and simple card. I have used three different stamp sets from Winnie & Walter. 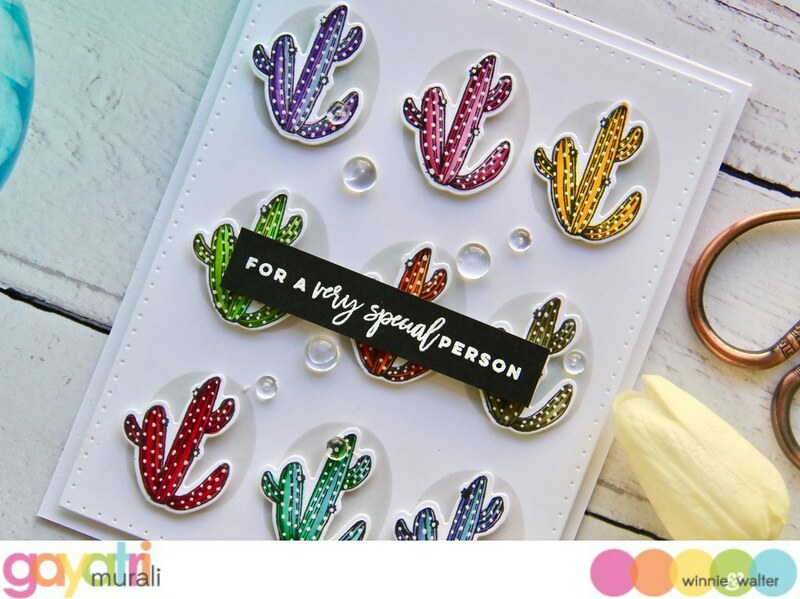 They are Dotty About You with Lydia Evans stamp set, Kindness with Evelin T Designs and coordinating cutaways and finally, Sentimental: Gift stamp set. I wanted these cacti to be popped up into three rows and columns on a white panel. But I wanted something on the background to soften the stark contrast of the white background. 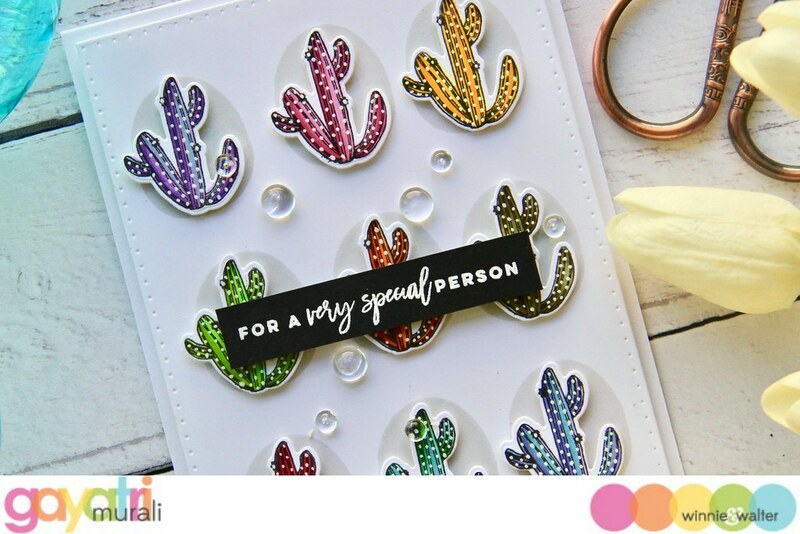 Nothing dark but something subtle and small enough for the cacti to fit inside the stamped image. So I went through my Winnie & Walter stamp set to find a solid round stamp image. I did find a few of them but they were perfect round. I wanted something organic looking. So I chose the background image from the new Dotty About You by Lydia Evans stamp set. It was a soild stamp and roundish not the perfect round image. I was so happy when I found it. I die cut a white cardstock using Essential: Katherine Cutaway and used Simon’s Fog dye ink to stamp the image on the background to anchor the cacti. I then popped up all the die cut cacti using foam adhesives. The sentiment is from Sentimental: Gift stamp set which I white heat embossed on a strip of black cardstock and adhered on the middle of the card front. The panel is embellished with few clear droplets and mounted on a white card base using foam adhesives. 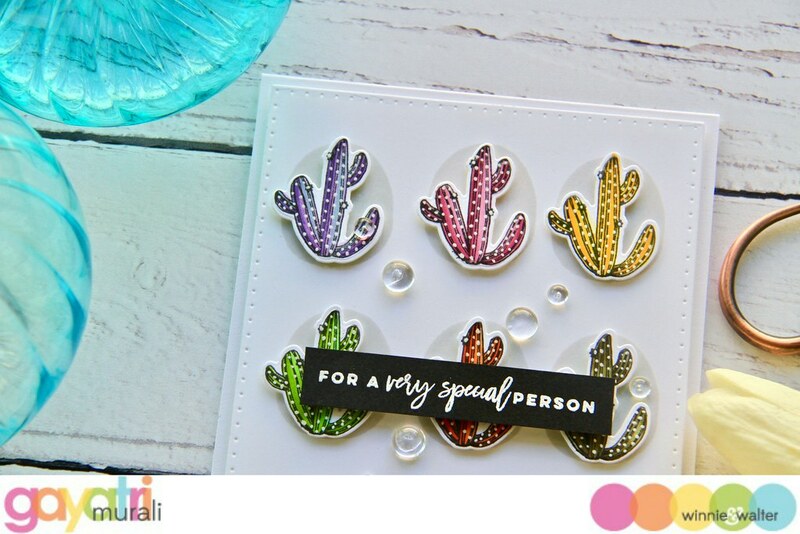 I really love the colourful cacti with the white dot details. 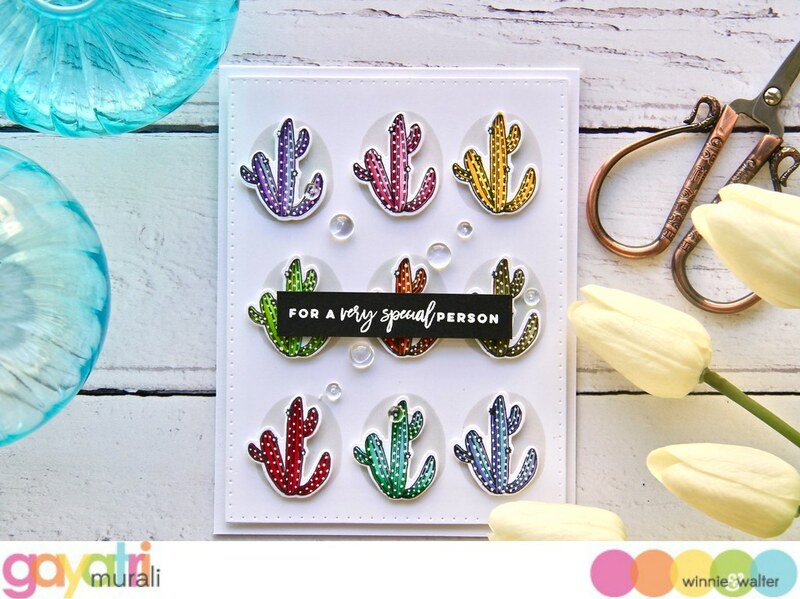 I think the dots make the cacti pop and the subtle gray background behind the cacti anchors them, reduces the contrast as well as adds interest. Love how this card turned out. All supplies used to make this card are listed below. This is so fabulous!! Love the rainbow colours and the white dots really add a lot of interest. Using a solid stamp behind them in a soft colour is such a genius idea, might have to try that myself…….